Natural Import Company - Traditional Japanese foods - Mitoku Shiitake Pieces - 1.4 oz. 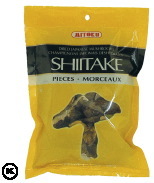 Mitoku Shiitake Pieces - 1.4 oz. Ingredients: Japanese dried shiitake mushroom (Mixed Grade). Thin, Open-caps. Shiitake Pieces are the ware-shiitake grade of shiitake mushrooms. These mixed grade shiitake work well in making an all-purpose soup stock, known as "dashi." This simple stock is great for soups, stews, sauces, gravies, noodle broth; and dips for tempura, fried mochi, and fried tofu.